According to most recent census data, California is home to more people of Native American/ Alaska Native heritage than any other state in the Country. There are currently 109 federally recognized Indian tribes in California and 78 entities petitioning for recognition. Tribes in California currently have nearly 100 separate reservations or Rancherias. There are also a number of individual Indian trust allotments. These lands constitute “Indian Country”, and a different jurisdictional applies in Indian Country. For Indians and Indian Country there are special rules that govern state and local jurisdiction. There may also be federal and tribal laws that apply. Insufficient tribally-specific data makes it exceedingly difficult for American Indian/Alaska Native communities to document the magnitude and nature of problems such as child abuse, domestic violence, or crime so that tribes can secure the funding necessary to address these problems. It also makes it difficult for tribal/state/local partnerships to work on these problems together. To begin to address this issue, the Judicial Council of California, in collaboration with the Tribal Law and Policy Institute, investigated what tribally-specific data is available and prepared a summary of these data sources and a related annotated bibliography. 1. How many California tribes are there? There are 109 federally recognized Indian tribes, including several tribes with lands that cross state boundaries. There are also about 45 tribal communities of formerly recognized tribes that were terminated as part of the United States’ termination policy in the 1950s or tribal communities that were never recognized by the federal government. 2. Where are the tribes located? 3. How many Native Americans reside in California? California has the highest Native American population in the country. According to the 2010 U.S. Census, California represents 12 percent of the total Native American population (approximately 720,000) identified themselves as Native American. Over one-half of the state’s Native American population is composed of individuals (and now their descendants) who were relocated to large urban areas as part of the federal government’s termination policy. 4. 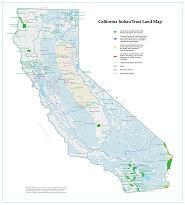 How large are the California tribes? California’s tribes are as small as five members and as large as 5,000 members. Compare these numbers to those of Oklahoma’s tribes, which range from 200 members to 315,000 members. 5. Why is the Native American population so diverse? Like all other tribes around the country, California’s tribes have a tragic and tumultuous history. Before the missionary, fur trapping, and gold rush era migrations, California’s Native American population was estimated at about 200,000. Between 1851 and 1852, 18 treaties were signed between the tribes and the United States. The treaties reserved 7.5 million acres for the tribes but were rejected by the U.S. Senate in secret session at the request of the State of California. The tribes, believing that the treaties were valid, relinquished the historic territories and moved to the reserved acreage. However, once they reached their new locations, they were turned away. The tribes were not officially notified of the reason for this until 1905, some 55 years later. In the 1950s, nearly 100 years later, the federal government’s continued attempts to force assimilation on the entire Native American population resulted in the termination (i.e., loss of federally recognized status) of over 109 tribes throughout the United States. In California, this came about through the Rancheria Act of 1958, which resulted in the termination of federal status of 44 Indian tribes. The Relocation Act of 1956 provided funding to establish relocation centers for Native Americans in urban areas like Denver, Chicago, Los Angeles, and San Francisco, and to finance the relocation of individual Native Americans and their families. Funding for similar reservation-based programs was denied. Those who participated in the federal relocation programs were usually required to sign agreements that they would not return to their respective reservations to live. American populations in the United States. 6. How are California’s Indian child welfare issues impacted by this history? Large urban Native American populations from out-of-state tribes create a continuing issue concerning notice to and participation of out-of-state tribes. Diverse governmental, cultural, social, economic, and geographic factors come into play because every tribe, regardless of its size, has its own governmental structure and process, cultural and social standards, economic issues, and specific social services needs. California, with more in development. 7. What tribal programs are in place today? Many tribes have developed their own social services programs, which include child welfare departments; these programs provide training, counseling, advocacy, and other services for children and families. There are no Indian Health Service (IHS) facilities in California. In urban areas, there are urban Indian health programs funded in part by federal dollars. Tribes own and operate their own health programs through contracts and compacts with IHS under the federal Indian Self-Determination and Education Assistance Act. Many of these programs provide their own counseling and treatment programs. Intertribal organizations provide a wide range of services ranging from referrals to advocacy in child custody proceedings. Several intertribal organizations license foster homes for placement of children who enter the system. As more tribal courts develop, tribes will assert jurisdiction over tribal children and handle at least some child custody issues internally. Many tribes have made Indian child welfare a priority and are active participants in local roundtables and alliances to improve communication and cooperation in Indian child welfare matters. Administration for Children and Families (ACF) Native American Programs Training “Working Effectively with Tribal Governments”. This training gives a good overview of the historical, legal and cultural considerations involved with working with tribes. Registration is required for first time users. This broadcast features discussions by state and tribal court judges on the history of Native Americans in California, U.S. government impact on Native American families, federal and state laws, the Indian Child Welfare Act, and application of the ICWA.